In last week’s Strategy, we talked about your level of Retirement Bucket™ Dependence, and the first step in The Relaxing Retirement Formula™ which is what your desired lifestyle costs to maintain. The next step is figuring out how you’re going to pay for it all without having to depend on the income from work to do it. And that’s what we’re all after. Discovering that you’ve built up enough money to support your lifestyle without “having to work” is one of the most liberating days of your life. It flips the entire equation in your favor, and puts you in the “catbird” seat where you completely call the shots. Too often, people want to skip right over into more advanced strategies. However, before you can begin to delve into tax strategies, investment strategies, or estate planning strategies, etc., you have to be crystal clear on where you stand in relation to your biggest goals. 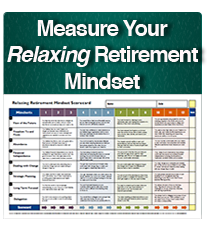 As we’ve outlined over the last few weeks in studying Jim and Sandy Independent vs. Ron and Rose Reactionary, it’s critical that you determine your level of dependence on your Retirement Bucket™, i.e. your retirement savings. Do you need $5,000 per month over and above social security and a pension? Or do you need $12,000? As you might expect, there’s a huge difference. If you’ve been following right along, then you answered the first half of that equation last week. Now, to determine your level of dependence on your Retirement Bucket™, we need to figure out how you’re going to pay for the lifestyle you’ve outlined. How much income will automatically come in? When will it come in? And, will it automatically keep pace with inflation? If you and your spouse are already receiving social security retirement income, then you already know what your income is. However, if you haven’t begun receiving your benefits, you want to determine the amount you’ll both receive as early as age 62 up to your “full” retirement age (typically age 66 if you’re reading this). You should receive a social security benefits statement every year around your birthday which reveals your anticipated benefits under all options. The second source of fixed income is pensions. Under pensions, there are two main ways to receive a pension payout: as a lump sum check or as a monthly annuity (a monthly check). If you can receive your pension in a lump sum, it is typically transferred directly to an IRA tax free and you are in charge of “creating” income from this lump sum of money in your IRA. It doesn’t happen automatically. Assuming for a moment that you are receiving, or must receive your pension in the form of a monthly annuity, you may select the single life annuity version (which ends at your death and does not continue to your spouse). Or, you can select one of a variety of joint and survivor options to insure that your spouse receives some pension benefits when you pass away. If you’ve already retired, you may have already seen these: 100% joint and survivor, 50%, 66 2/3%, 10 year period certain, etc. Fixed income source #3 is rental property income. This is a place which requires you to do some real honest homework. And, that’s because what we’re looking to determine is “net” rental income, not gross. Many people focus on the rent check(s) they receive each month. That’s a good start, but from that gross check each month there are numerous potential expenses that have to be taken into consideration: real estate taxes, mortgages (if you still have one), utilities (if you’re paying them), and most importantly, maintenance and repair. Properties require upkeep. And, if you’re not the one doing the work, this can be quite costly. So, an honest, rational projection of future maintenance costs should be factored in to determine your “net” rental income that you can expect. Once you have a clear picture of all (3) of these potential monthly income sources, we have to examine what they look like in the future. This is where we will continue in the next Retirement Coach Strategy of the Week.